As of this writing, it’s nigh impossible to find the Switch via conventional retail channels. There are a number of sites that supposedly track stock if you have the patience for that kind of thing. (www.nowinstock.net, for example) I kept a close eye for a few days, but the only hit came in the form of the Gamestop preorder mentioned above. So while the conventional retail supply has been exhausted, you can easily find the Switch on the secondary market through sites like Amazon and eBay. I dusted off my eBay account and started eyeing Switch auctions. Most auctions were closing between $450 and $500 USD, with many going for much more. Be prepared to pay a premium for the blue & red joycon model. I was willing to pay up to a $100 markup, but anything beyond that seemed excessive. (For the record, I work hard and this is my hobby) This is the point where an eBay seller named “vagbreath” entered my life. I feel it’s worth mentioning the seller’s name because lol, vagbreath right? I came across vagbreath’s auction, which at the time was bidding at $380 with a few minutes to go. (the base system retails for $299) Being an impatient man child, I didn’t want to bid on an auction where I’d be waiting for cross country shipping, so I checked to see where vagbreath was currently hanging his or her hat. (turns out it’s a ‘him’) Imagine my surprise when I discovered that vagbreath was located only a few towns away from Mousepad Heroes HQ. If I won the auction, I could probably arrange for pick-up and at the very least shipping would be quick. 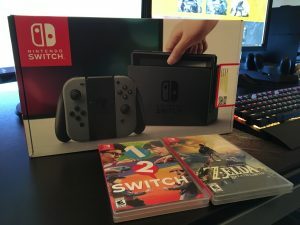 I sniped the auction with 10 seconds left to go and became the proud owner of a new Nintendo Switch for a paltry $405. Vagbreath turned out to be quite amenable to a local pick-up and he was a heck of a nice guy as well. It was cold out so I didn’t have time to ask him the origin of his eBay name and/or whether or not he had any regrets about the handle he likely picked in his early 20s. We parted ways and the MPH crew headed back to HQ for a Saturday night of nerding out. The Switch can of course be used with a TV, a la couch style, like most console gaming systems. The real advantage to this new system is the hybrid portability. At first I thought I would prefer couch style, conventional TV gaming. What I found is that gaming on the Switch tablet is quite awesome. It’s obviously not ideal for co-op games but it’s perfect for solo adventuring. 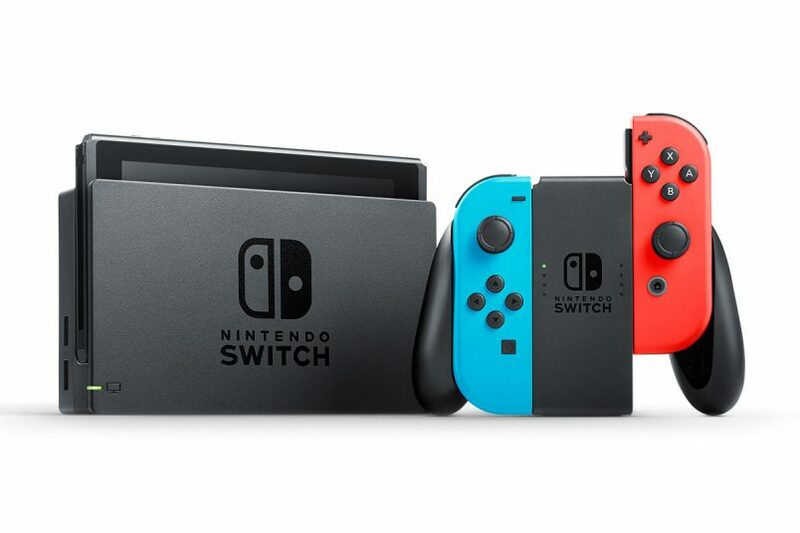 Again, the portable advantage that the Switch has over systems like Xbox and PS4/3 is clearly the first-to-market value proposition that Nintendo intended to deliver and they hit the bullesye. MPH crew member Poparella (@MPoparella, Poparella on YouTube) nailed it when she said, “..it’s like the 3DS and an iPad had a baby”. Yes, there are a number of handheld gaming systems on the market from the major competitors. Mobile gaming on iOS and Android have also shaped the portable gaming landscape. Switch is revolutionary because it’s bringing the power of console gaming to the portable market. As a family, we no longer have to strategize about which TV we’ll tie up with our gaming systems. This is a sizable advantage for Nintendo and I can’t wait to see how the catalog of games expands. Speaking of games, we started our collection withThe Legend of Zelda: Breath of the Wild (duh, of course) and 1-2 Switch, which offers co-op and team play. Zelda is strictly solo. You can read a great review of Breath of the wild on IGN, so I won’t repeat what’s already been widely reported. The game play, the graphics and the open world adventure are simply amazing. I would liken the experience to that of the first time I played an MMO like World of Warcraft. It has that sandbox, non-linear feel to it and so far I’m loving the adventure. I’m also really enjoying watching my kids discover what open world gaming feels like and the challenge of finding your own way. Minecraft has taught them well and they’re already surpassing me in this latest iteration of Zelda. We’re fortunate that we were able to afford this fantastic new gaming platform on the secondary market. For those still waiting, there appears to be scant news from Nintendo and the industry in general as to when shelves will be restocked. Retailers (at least in the UK) are indicating that Nintendo has thus far been mum on the topic. At this time, the best option appears to be pre-ordering a bundle through stores like Gamestop and that requires laying out $500 or more in one shot. In the meantime, I need to steal some steak from the Bokoblins or risk dying to exposure. Hold my calls.